Jingzhaotoxin-III (ß-TRTX-Cj1α) has been isolated initially from the Chinese Tarantula spider Chilobrachys Jingzhaovenom. Jingzhaotoxin-III selectively inhibits the activation of the voltage-dependent sodium channel Nav1.5 in heart or cancer cells with an IC50value close to 350 nM. 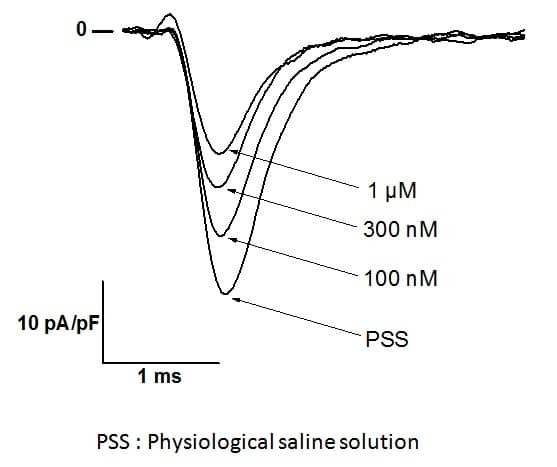 It is inactive on Nav1.2, Nav1.4, Nav1.6 and Nav1.7 and should therefore be considered as an interesting research tool to discriminate between sodium channel subtypes. Jingzhaotoxin-III binds onto receptor site 4 presumably located on DIIS3-S4 linker of Nav1.5 and supposedly blocks Nav1.5 through a different mechanism than ProTx-II and Huwentoxin IV. ß-TRTX-Cj1α is composed of 36 amino acid residues including 6 cysteines cross-linked according to a C1-C4, C2-C5 and C3-C6 pattern. Jingzhaotoxin-III also inhibits Kv2.1 channel with an IC50 of around 700 nM. Fig 1: Representative effects of different Jinghzaotoxin III concentrations on the amplitude of INa. Jinghzaotoxin III was applied externally to the cell at the time and concentrations indicated on top. Inward sodium currents were triggered in human MDA-MB-231 breast cancer cells by 30 ms-long voltage steps from -100 to -5 mV, from a holding potential of -100 mV. 1 step every 2 sec. Product code: N/A. Category: Sodium channels. Tag: Nav1.5. Animal venoms contain a fascinating array of divergent peptide toxins that have cross-activities on different types of voltage-gated ion channels. However, the underlying mechanism remains poorly understood. Jingzhaotoxin-III (JZTX-III), a 36-residue peptide from the tarantula Chilobrachys jingzhao, is specific for Nav1.5 and Kv2.1 channels over the majority of other ion channel subtypes. JZTX-III traps the Nav1.5 DII voltage sensor at closed state by binding to the DIIS3-S4 linker. In this study, electrophysiological experiments showed that JZTX-III had no effect on five voltage-gated potassium channel subtypes (Kv1.4, Kv3.1, and Kv4.1-4.3), whereas it significantly inhibited Kv2.1 with an IC50 of 0.71 ± 0.01 μM. Mutagenesis and modeling data suggested that JZTX-III docks at the Kv2.1 voltage-sensor paddle. Alanine replacement of Phe274, Lys280, Ser281, Leu283, Gln284, and Val288 could decrease JZTX-III affinity by 7-, 9-, 34-, 12-, 9-, and 7-fold, respectively. Among them, S281 is the most crucial determinant, and the substitution with Thr only slightly reduced toxin sensitivity. In contrast, a single conversion of Ser281 to Ala, Phe, Ile, Val, or Glu increased the IC50 value by >34-fold. Alanine-scanning mutagenesis experiments indicated that the functional surface of JZTX-III bound to the Kv2.1 channel is composed of four hydrophobic residues (Trp8, Trp28, Trp30, and Val33) and three charged residues (Arg13, Lys15, and Glu34). The bioactive surfaces of JZTX-III interacting with Kv2.1 and Nav1.5 are only partially overlapping. These results strongly supported the hypothesis that animal toxins might use partially overlapping bioactive surfaces to target the voltage-sensor paddles of two different types of ion channels. Increasing our understanding of the molecular mechanisms of toxins interacting with voltage-gated sodium and potassium channels may provide new molecular insights into the design of more potent ion channel inhibitors. With conserved structural scaffold and divergent electrophysiological functions, animal toxins are considered powerful tools for investigating the basic structure-function relationship of voltage-gated sodium channels. Jingzhaotoxin-III (β-TRTX-Cj1α) is a unique sodium channel gating modifier from the tarantula Chilobrachys jingzhao, because the toxin can selectively inhibit the activation of cardiac sodium channel but not neuronal subtypes. However, the molecular basis of JZTX-III interaction with sodium channels remains unknown. In this study, we showed that JZTX-III was efficiently expressed by the secretory pathway in yeast. Alanine-scanning analysis indicated that 2 acidic residues (Asp1, Glu3) and an exposed hydrophobic patch, formed by 4 Trp residues (residues 8, 9, 28 and 30), play important roles in the binding of JZTX-III to Nav1.5. JZTX-III docked to the Nav1.5 DIIS3-S4 linker. Mutations S799A, R800A, and L804A could additively reduce toxin sensitivity of Nav1.5. We also demonstrated that the unique Arg800, not emerging in other sodium channel subtypes, is responsible for JZTX-III selectively interacting with Nav1.5. The reverse mutation D816R in Nav1.7 greatly increased the sensitivity of the neuronal subtype to JZTX-III. Conversely, the mutation R800D in Nav1.5 decreased JZTX-III’s IC₅₀ by 72-fold. Therefore, our results indicated that JZTX-III is a site 4 toxin, but does not possess the same critical residues on sodium channels as other site 4 toxins. Our data also revealed the underlying mechanism for JZTX-III to be highly specific for the cardiac sodium channel. We have isolated a cardiotoxin, denoted jingzhaotoxin-III (JZTX-III), from the venom of the Chinese spider Chilobrachys jingzhao. The toxin contains 36 residues stabilized by three intracellular disulfide bridges (I-IV, II-V, and III-VI), assigned by a chemical strategy of partial reduction and sequence analysis. Cloned and sequenced using 3′-rapid amplification of cDNA ends and 5′-rapid amplification of cDNA ends, the full-length cDNA encoded a 63-residue precursor of JZTX-III. Different from other spider peptides, it contains an uncommon endoproteolytic site (-X-Ser-) anterior to mature protein and the intervening regions of 5 residues, which is the smallest in spider toxin cDNAs identified to date. Under whole cell recording, JZTX-III showed no effects on voltage-gated sodium channels (VGSCs) or calcium channels in dorsal root ganglion neurons, whereas it significantly inhibited tetrodotoxin-resistant VGSCs with an IC(50) value of 0.38 microm in rat cardiac myocytes. Different from scorpion beta-toxins, it caused a 10-mV depolarizing shift in the channel activation threshold. The binding site for JZTX-III on VGSCs is further suggested to be site 4 with a simple competitive assay, which at 10 microm eliminated the slowing currents induced by Buthus martensi Karsch I (BMK-I, scorpion alpha-like toxin) completely. JZTX-III shows higher selectivity for VGSC isoforms than other spider toxins affecting VGSCs, and the toxin hopefully represents an important ligand for discriminating cardiac VGSC subtype.